“If you’re passionate about posting great photos on your blog, you might just fall in love with this new feature. If you have Camera+ 3.0 on your phone (and WordPress for iOS 2.9.5 or higher), you’ll be able to quickly post photos using the Camera+ app! Simply launch the WordPress app, and tap the Photo button. Posting a photo from the Camera+ Lightbox is dead easy. Tap “Add Photo from Camera+,” and your phone switches to the Camera+ app – select a photo to load it into the WordPress app. Add a Title and a Description (both optional), and boom! You’re done. Using Camera+ to snap your photo is just as easy. Tap “Take Photo with Camera+” to switch to the Camera+ app’s camera. Make a “meow” sound to locate your cat, add effects, borders, and crop your photo. When you’re done, just press “Use” and your photo is imported into the WordPress app where you can add details if you want. As more camera apps open up their features for other apps, we’ll look into making more options available. Camera+ was the first to open their app up for integrations, but hopefully more will follow. 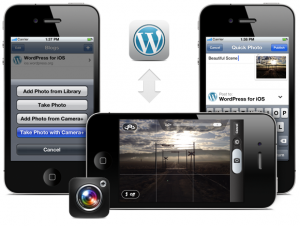 WordPress announced Thursday that the latest version of WordPress for iOS and Camera+ app will allow bloggers to post images from their photo library straight to their blogs without a third party application or waiting to post on the computer. The news is great for a variety of bloggers whose daily lives play an integral role on their blogs, whether the focus is on street culture, food, or fashion. With the update, bloggers can post their photo essays like they could with Instagram on Twitter, but take the time to add more than just 140 characters to describe their pictures. Mobile photography is easily becoming a great resource for bloggers because they no longer need to lug around bulky DSLR cameras or even the already portable point-and-shoots. If you own an iPhone, chances are you might also have Camera+, one of Apple’s top 10 bestselling apps of all time worldwide. The app recently reached its 7 millionth download, making Camera+ the most popular paid photo app to date despite Instagram being free. “Posting a photo from the Camera+ Lightbox is dead easy,” WordPress said on its official blog. “Tap ‘Add Photo from Camera+,’ and your phone switches to the Camera+ app – select a photo to load it into the WordPress app. Add a Title and a Description (both optional), and boom! You’re done.” Users can also take photos from their Camera+ app and select to use the photo on WordPress, so order doesn’t really matter. Other updates to Camera+ 3.0 include new app icon, focus and exposure locks, multiple photo library import, improved MSM sharing and web links, and new VolumeSnap settings for those who prefer to use their volume up button as the shutter like a traditional camera. Users can also send Camera+ photos to more than just WordPress, but also Tweetbot, Twitterific, and Foodspotting. The ability to post photos on the go is a large trend in micro-blogging as bloggers continue to scavenge their city for interesting takes on what they see in their daily lives, or hidden gems that could only be described by photos. Camera+ also stated on their official blog that it hopes the integration will encourage other photography apps to follow suit. At the moment, the mobile app for Tumblr lets users upload photo from their library as well, but not as directly from another photography app integration. Now that the camera specifications on the iPhone 4S and the new iPad are more improved than ever, edited pictures from Camera+ might even rival the quality of an actual handheld digital camera. Photos from the iPhone 4 currently dominate as the most popular photography platform of choice on Flickr, leading just above the Canon EOS 5D Mark II and the declining Nikon D90, so it won’t be surprising if camera phones take over traditional photography by the year’s end.